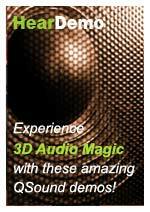 QSound Labs is a dynamic, exciting and growing company. We recruit motivated team members who share our entrepreneurial spirit for researching, developing and marketing ground-breaking audio technology. If you're interested in working for QSound, simply submit your resume to info@qsound.com. We will review your resume carefully, and will contact you if we identify a position that could capitalize on your interests and expertise during the next six months. There are currently no positions available at this time, please check back. Copyright © 2010 QSound Labs, Inc.